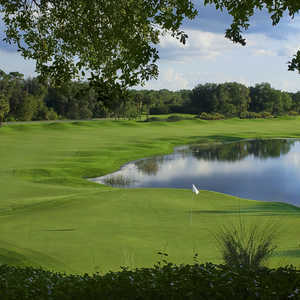 LAKE BUENA VISTA, Fla. -- Lake Buena Vista Golf Course is often considered the least-heralded of the four courses at Walt Disney World Resort in central Florida. One of Lake Buena Vista Golf Course's most memorable shots: The short par-3 seventh hole to an island green. Think of it this way. Byron Scott was considered the fourth-best starter for the Los Angeles Lakers back on the "Showtime" teams that won five championships in the 1980s (behind Hall-of-Famers Magic Johnson, Kareem Abdul-Jabbar and James Worthy). Moral of the story? Sometimes being fourth best is still pretty darn good. Focusing on what Lake Buena Vista G.C. has -- not what it doesn't -- tends to create a greater sense of appreciation for a course built in 1972 that caters to any level of player. 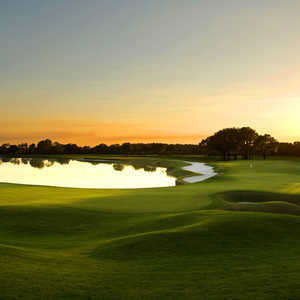 It's true that Lake Buena Vista doesn't host the PGA Tour anymore like Disney's Magnolia Course and Palm Course. It is, however, the only Disney golf course to have hosted both the PGA Tour and LPGA Tour. This Joe Lee design hosted the PGA Tour Fall Classic (with the Magnolia) from 1980-93 and 1995-97 and the LPGA's HealthSouth Tournament from 1996-97. Bob Tway still owns the course record with a tidy 61. Before her Hall-of-Fame career took off, Karrie Webb won the 1996 HealthSouth here. Lake Buena Vista G.C., the shortest of the four Disney courses at 6,819 yards, tends to be a hybrid of the wide-open Magnolia and the tighter confines of the shot-making Palm. Lake Buena Vista is also the only Disney golf course with out-of-bounds stakes. Don't worry. The GPS in the carts helps players steer clear of those dreaded stakes. 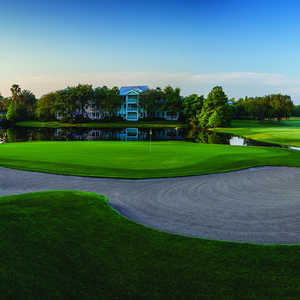 The front nine, which winds through the Old Key West Resort, gets hemmed in at times, requiring some target golf. The back nine opens up a bit with more of a resort course feel. Some golfers don't like being surrounded by the hustle and bustle that comes with a Disney resort so close by. Others find it a thrill that impromptu galleries are looking on. Spectators -- watching from resort porches and balconies or riding the riverboats that navigate a series of canals within the course -- usually reward good shots by clapping or cheering. Giving them something to celebrate about is no easy task. Eleven holes are dotted with water hazards, starting with the first, a 514-yard par 5 where second shots that hook left get rinsed. A canal inlet hugs the narrow green on the short 354-yard, par-4 sixth hole. The 157-yard, par-3 seventh features an island green, yet it's big enough not to be too intimidating. From there, the course settles into a nice rhythm. There's nothing too tricked up or fancy, just a steady diet of classic Florida golf. Many guests who tee it up at Lake Buena Vista G.C. are Disney Vacation Club members. This relationship gives Lake Buena Vista a sort of "country club" feel, where the same golfers come back year after year. The return play is a testament to the quality of a fun, challenging layout that often gets overlooked.